Driving is becoming too dangerous. First we were warned to be on the lookout for drunk drivers. Now we have to watch for drunk deer, too. Well, not drunk in the literal sense, but a recent report from Ottawa’s National Wildlife Research Centre noted that animals are temporarily debilitated when they ingest road salt. The effect is similar to intoxication. And the impaired functions can be triggered with as few as five pieces of salt. Scientists say that the high level of salt toxicity in sodium chloride is to blame. 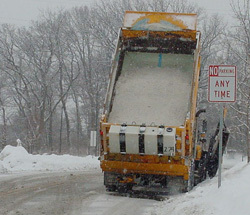 Two Canadian provinces, Alberta and Saskatchewan, are investigating alternatives to road salt. Who needs a food plot now, when all it takes is a road saltshaker? The toxic effect is interesting. I assume that works the same on groundhogs and other animals as well we see eating salt along the road. Interesting? Maybe so, but I think it tragic. It is a clear indication that road salt is harmful to wildlife. And it is harmful to us as well. I wonder how many animals succumb to road salt vs hunting. Now that would be interesting to me.